The Hall of Prolonging Happiness (Yanxi gong) was destroyed by fire during the Daoguang reign (1821-1850). 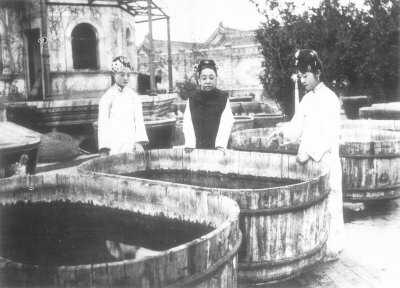 In 1931, a few years after the Palace Museum was founded, three two-storied warehouses were built for storing artifacts. In 2005, the museum installed the Research Center for Traditional Calligraphy and Paintings in the east warehouse, the Research Center for Ceramics in the west warehouse, and a Ceramics Laboratory in the central warehouse. It used to be the residence of consorts and concubines during the Ming and the Qing dynasties. After the destruction, it remained in ruin. In 1909, the Qing government initiated the construction of a western-style "Hall of water” in a pool. The hall is built on a white marble base, with iron cast and glass walls and floors. By its completion, water would be filled into the poll surrounding the hall, so that people inside the pavilion could view the swimming fish through the transparent glass walls. It is popularly known as the "crystal palace". However, not long after the project was launched it stopped due to the tight budget. Now, the marble carvings and the iron cast are only for visitors to imagine. Click here for a virtual reality (VR) tour of the Bower of the Spirit Pool (Lingzhao xuan).